After Superman breaks Batman free of the Blackrock's control they split up with Superman fighting the controlled alien heroes and Batman setting up a contingency plan in case things go wrong. They are captured and confronted by the force responsible for bringing the alien armada to Earth; Despero. Despero has convinced this race that mankind is too evil to let live. Superman manages to convince the aliens otherwise and they defeat Despero. Story - 3: Ok, I wanted to be nice. I wanted to try and give this issue a fair chance and overlook the lateness and judge the story on its own merits. The problem is that this story, as exciting as it was at times, was kind of all over the place and to have it end with this touchy-feely "we're bad people but we can overcome it" thing really fails to serve the story that was being told. I realize that Mark Verheiden is the author and that this was obviously his intent, but as a reader I finished this issue and thought, "That was it?" The story that I was reading and had expectations for and the story Mark was writing were obviously two different stories. This doesn't mean that Mark is a bad writer or that he should appeal to my whims but at the same time if I don't like this final chapter based on what has come before then my opinion is just as valid as his intent. More than the anti-climatic feeling I was left with I had issues with the fact that Batman's ultimate solution to the problem was to nuke the infected beings so it didn't spread. I don't buy this for a second. This is not the simple, "that is so out of character" thing because characters should be allowed to act outside of what has been previously established as long as it makes sense for the story in question. This is different. This isn't out of character it isn't even close to the character. With everything Batman has been through a nuclear device he confiscated from the Joker would never be the answer. It just doesn't make sense. And I won't even go into how Superman wouldn't go along with it either. This wasn't a bad story arc. It wasn't the best, but it wasn't terrible. The beginning was very strong but as the story reached it's conclusion it just went downhill. The ending was very unsatisfying, delays notwithstanding. It had some really great Superman/Batman moments but that doesn't make a compelling story. Again, I wanted to like it. I wanted to say nice things about it. I just can't and I feel bad about that. Art - 4: The artwork was pretty smooth. I don't recognize the names of the artists but they draw a neat looking Batman and a really solid looking Superman. There were a few too many full page splashes, especially that last page where Superman and Batman were being all kinds of chummy, but they looked nice just the same. Cover Art - 4: The cover looked great, but it was a harbinger for my feelings to come. 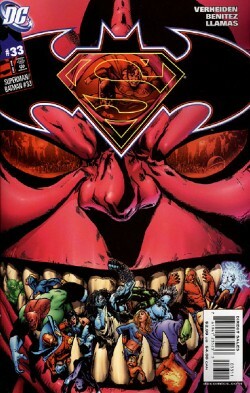 I looked at the cover and though, "Despero's the bad guy? This is the ultimate villain? No, that can't be right." So I won't hold the interior content against the cover, which looked kind of neat.